Ryan Mania is looking forward to a life away from horse racing after announcing his retirement from the sport. The Scot, who won the Grand National in 2013, admitted he had grown tired of the jockey lifestyle. "Racing's been great to me and I love it, but it just takes its toll and you think 'there's more to life than this'," Mania told BBC Scotland. "I'd like to do something completely different, I'd enjoy doing something in the media or TV, something like that." And the 24-year-old added: "I've been in a full time job since I was 15 and it would be nice not to have to do anything, and just explore other options and see what best suits me. "Weight issues have been bothering me for about six months and now I have a young son I'm also missing a lot of time at home with him." "First and foremost I'd like to start playing rugby again, as I had to stop that when I became a jockey, so it would be nice to see all my old friends again." 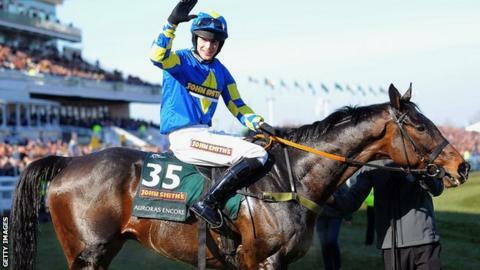 Just 24 hours after winning the Aintree showpiece on 66-1 shot Auroras Encore in 2013, Mania was rushed to hospital following a fall at Hexham in which he suffered a neck injury. He revealed the constraints involved in being a jockey were behind his decision to leave the sport. "I just felt it's the right time, it's not an easy life," he added. "Weight issues have been bothering me for about six months and now I have a young son I'm also missing a lot of time at home with him. "All the race courses are a long way away so we spend our life in the car driving from meeting to meeting. "You're up at the crack of dawn then you've got to exercise the race horses, then you've got to go and lose weight, usually through sweating, so it means you can't live any sort of normal life - you can't accept an invite to dinner because you can't eat, it just restricts what you can do."